There’s no better feeling for a photographer than to have people gush over your photo, suggesting you submit it to National Geographic, or better yet, asking if they could buy it. Unfortunately, most of your shots don’t get that way with a simple press of the shutter. Most are post-processed, some heavily and more often than not, it’s the HDR images that pull the most praise. So how hard is it to learn HDR? Can a hobbyist learn HDR, or does it take years to perfect? The answer is Yes and No. Learning HDR, whether you use Photoshop, Photomatix or Nik’s HDR Efex Pro, could take years; but, with RC’s newest title The HDR Book, you’ll be producing fantastic shots in under a week. What makes people crazy is that the first time you use Photomatix, after you press the “create” button, you wait for your masterpiece to appear. When it finally does, it usually looks plain awful. That’s because the image created is really not finished. You next need to “tone-map” the image. That’s where the magic begins to happen. Only problem here is that there are so many choices in the tone-mapping process that most mere mortals get overwhelmed with all the check boxes and sliders at their disposal. It can be quite intimidating. 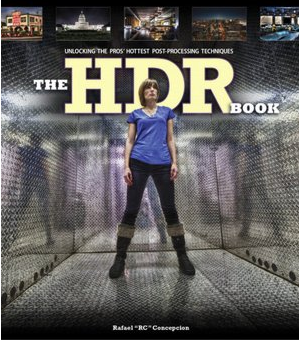 Enter The HDR Book. Just as the Canadian Mounties save the day up north, RC saves the photographic day for his readers. In a non-techie tone, he explains what you need to do to make the choices that will both start and finish your photos into the masterpiece that you hoped for. Luckily for you, he doesn’t confine his suggestions to one specific brand of HDR software. He actually shows you how to create your art using each of the three primary software choices. He also spends an appropriate amount of time discussing the setup of your shot, what type scenes are the best candidates for HDR and shortcuts that will save you processing time. He even discusses how to do single-shot HDR’s and using HDR for black and white photos. Step by step, in ten different photos, he shows how each situation can be handled using each of the three software packages. But then, the secret sauce is revealed when he takes each image back into Photoshop for the final tweaks that make that photo really pop. As a bonus, Kelby Training did an hour- long webcast about the book that anyone can view for free. View that first or just head straight for your local book store and get started with the real thing. Your pictures will love you for it.